increase their relevancy to a wider audience. The first recommendation led to the Recovering America’s Wildlife Act’s (RAWA’s) House and Senate bills and advocacy efforts; the second led to the development of the National Conservation Outreach Plan (NCOP) to promote the relevancy of wildlife agencies to a broader audience. 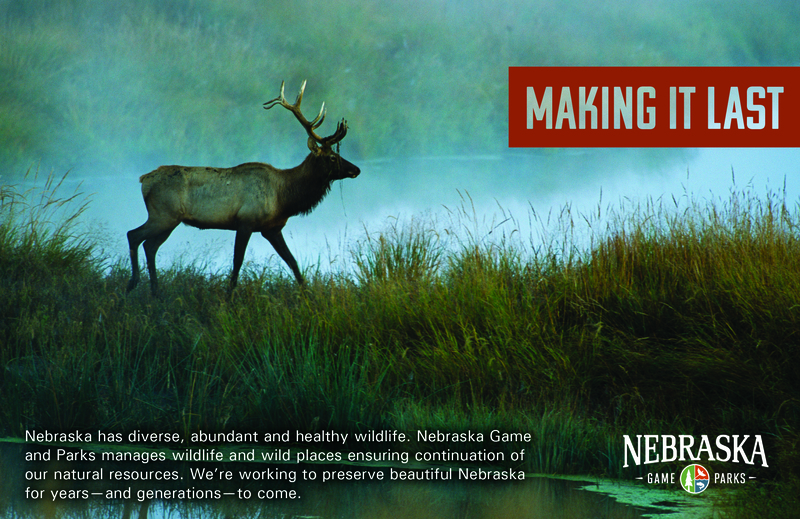 Nebraska will use the toolkit to frame Making It Last in itsAFWA multimedia campaign, including this sample print ad. States can select an appropriate image and supporting text for each audience described in the toolkit, based upon what resonates with them. In spring 2018 AFWA and a national steering committee of communication professionals wrote an RFP for a marketing firm to develop a public awareness campaign. The steering committee then worked with Güd Marketing to develop the campaign. At the ACI annual conference in August the “Making It Last” campaign was shared in a general session. The NCOP steering committee met at the conference to discuss further elements of the campaign and its implementation plan. The campaign was unveiled in its final form at the September AFWA meeting. So why do we need the “Making It Last” campaign? This is an opportunity for us to connect with new audiences and be relevant to more than our traditional audience. And our agencies’ traditional audience is only shrinking.The most recent USFWS 2011 Survey of Fishing, Hunting, and Wildlife Associated Recreation research points to the continued long-term decline in participation in hunting and fishing, with participation rates at about 5 percent for hunters and 16 percent for anglers (fortunately short-term trends show an increase in fishing). Meanwhile research also shows that those who do not hunt and fish perceive our agencies are relevant only to hunters and anglers or do not even know what we do. While we can support R3 efforts we can also reach out to new segments of the population who have a passion for wildlife and nature. The good news is that there is growing participation in wildlife-watching as well as interest in conserving wildlife and natural places in every state. According to the most recent USFWS Report (2011), 37 percent of all Americans participate in wildlife-watching. National research, such as the 2017 Nature of Americans study, found that more than two-thirds of Americans place a high value on nature as important to their physical and emotional well-being and strongly believe it should be conserved for future generations. This presents an exciting opportunity for fish and wildlife agencies to become relevant by implementing a campaign to increase awareness of the critical role our agencies play in conserving the nature and wildlife these audiences care about. If all state agencies commit to supporting this campaign there will be unified momentum behind it. An implementation toolkit, including proposed paid and non-paid media approaches; evaluation recommendations and more, will be provided to enable each state agency to implement the campaign regardless of their budget constraints or other communication needs. Hopefully we will all have many campaign learnings and successes to share at next year’s ACI meeting!